It’s been a couple of months now since Starbucks released their chocolate line – the line that is sold in non-Starbucks stores, like Target – and I’ve been wanting to try several of the options since I first spotted them. The chocolates are a result between the collaboration of Hershey’s and Starbucks, and after reading good things about them on Candyblog, I was even more intrigued. 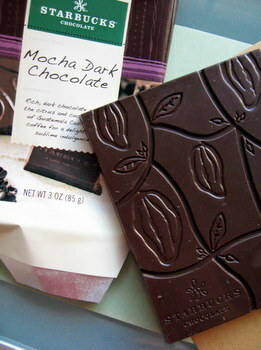 When they went on sale at a store near me, I was sold and picked up the bar that appealed to me the most, the Mocha Dark Chocolate. The bar is made of smooth, rich-tasting dark chocolate with finely ground coffee beans incorporated into it, and since I love chocolate covered coffee beans, I wasn’t surprised that I really liked the flavor that they brought in. They added texture to the bar, but were not really “crunchy” since the piece were fine. The bar is put together extremely well, given that the grains of coffee bean do not detract from the smoothness of the chocolate, or make the chocolate itself seem grainy. In fact, the chocolate melts in your mouth almost immediately when you bite into it. The only- very small – complaint I have is that the bar’s beautiful design doesn’t allow you to snap off a block or two for easy eating and I prefer that type o portion control to snapping off randomly shaped chunks when snacking. I’ll give the bar bonus points, however, because I happen to really like the coffee beans imprinted on the top of the chocolate. And, overall, I’d take one of these bars any day and the lack of an easy-snap design probably wouldn’t come into play because I know that I’ll eat more than I should in one sitting anyway. I haven’t tried this yet, but I want to. I would, if the bars were on sale! It would be fun to play around with this chocolate and make some desserts. Umm! I love going to Starbucks. 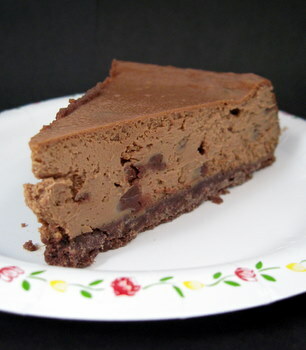 This looks really good, I love chocolate covered coffee beans also, and like the person above I agree that I also would like to try these in some desserts………..fun expierementation! I’d like to try them too. Just a comment on the review, what’s imprinted on the bar are not coffee beans but cacao fruits (also called cocoa fruits or pods). These pods contain the seeds that, after fully drying and fermenting, become cocoa beans.